The minutes, constitution and bylaws of the general council constitute one of the essential sources for the study of the Assemblies of God. These governing documents show how the Assemblies of God responded to debates on core doctrinal issues and challenges in world missions, how its national ministries developed, and how scores of other concerns impacted the Fellowship. 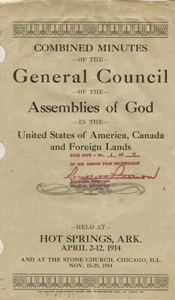 The first two general councils were held in 1914: Hot Springs, Arkansas (April) and Chicago (November). General councils were held on an annual basis from 1915 through 1921, and biennially starting in 1923. The general council minutes were always published with the constitution and by-laws, except for the years 1943, 1945 and 1947 when they were published separately. The title of this publication read "Minutes," except for the years 1927 through 1941, when the publication was titled "Constitution and By-laws." In addition to the booklets published for each general council, a number of "Combined Minutes" were published in the early years, which combined minutes from two or more general councils into one publication. 1969 (33rd: Dallas, TX, Aug. 21-26)--Go and Tell. . .
2007 (52nd: Indianapolis, IN, Aug. 8-11)--Impact! NOTE: If you are aware of the location of Minutes/Constitution and By-laws missing from the above holdings, please contact the Flower Pentecostal Heritage Center at archives@ag.org.